Did Two Communist Newspapers Motivate Lee Oswald to Kill Kennedy? Lone gunman theorists – people who believe Oswald shot John Kennedy and there was no conspiracy – have always had a problem explaining Oswald’s motives. Of course, if Oswald was (in non-technical parlance) a “nut,” his motivation might be hard for normal people to discern, and to understand. But it’s still the case that the lone gunman theory is more compelling if some discernable motive can be found – or at least plausibly theorized. One theory is that Oswald’s strong belief in Fidel Castro and the Cuban Revolution motivated him to act to protect the Castro regime and the Revolution. The best known supporter of this idea is author Jean Davison, who has theorized that Oswald was a self-appointed protector of Cuban communism. Supporting this scenario are two pro-Castro left-wing periodicals, in circulation in 1963, whose contents could have influenced Oswald’s thoughts and actions. Specifically, The Militant was a weekly newspaper that was “staffed, controlled, and published by the Socialist Workers Party” out of New York, NY, and The Worker was “an East Coast Communist newspaper” published by the Communist Party of the United States between 1958 and 1968. Both were communist papers, but they represented two brands of communism that were not mere rivals, but rather bitter enemies. The CPUSA (and thus The Worker) hued the Soviet line during Stalin’s regime, and afterward. The Militant was Trotskyist – staffed by followers of Stalin’s rival Leon Trotsky who was forced out of the Soviet Union into exile in Mexico, and there murdered (it is widely believed by Stalin’s agents).
. . . the contents of each newspaper advanced critical and hostile views towards President Kennedy and the U.S. government. Oswald, rather a naïf where leftist politics was concerned, apparently didn’t see the need to take sides in this sectarian battle. And indeed, both periodicals were pro-Castro. Based on an examination of these papers we can plausibly speculate that Oswald could have been influenced by them, since he was subscribed to and had been receiving both in the period leading up to the assassination, and the contents of each newspaper advanced critical and hostile views towards President Kennedy and the U.S. government. To show that Oswald’s murder of President Kennedy could have been influenced by the contents of The Militant and The Worker, we have to establish that he was subscribed to and receiving each newspaper during a period leading up to the assassination. The evidence shows that Oswald was indeed subscribed to and receiving copies of each newspaper in a period spanning approximately one year - from late 1962 to even after his death in November 1963. The Warren Commission’s analysis of Oswald’s finances between June 1962 and November 1963 illustrates that in December 1962, Oswald paid $1.00 for a subscription to The Militant. A card sent from Oswald to The Militant date stamped “December 17, 1962” shows that he paid $1.00 for a four-month subscription to the newspaper to be shipped to P.O. Box 2915 in Dallas. 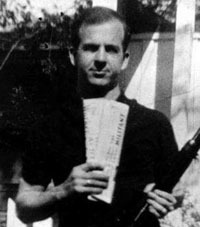 And indeed the famous “backyard photograph” taken of Oswald in March 1963 shows him holding one copy of The Militant. In fact, an FBI examination of the photo determined that Oswald was specifically holding the March 11, 1963, issue of The Militant in this photograph. Moreover, there is evidence that Oswald renewed his subscription to The Militant in May 1963, as a card rubber stamped “May 28, 1963” was sent to the periodical’s New York headquarters from Oswald for a $1.00 four-month subscription to be shipped to 4907 Magazine Street in New Orleans. This renewal would have taken Oswald’s subscription to about September 1963. In addition, it should be noted that in June 1963, Oswald sent a “Change of Address Notice” to The Militant, indicating that the periodical should be delivered to P.O. Box 30061 in New Orleans, showing that he wanted to ensure that he received issues of The Militant at a more convenient address. Showing that Oswald was receiving The Militant into the fall of 1963 after his renewed subscription expired is very important, in that the issues from October and November of 1963 were published in a time closer to the assassination. According to a note located in the Warren Commission Report, “Oswald received copies of The Militant after September 1963 but there is no record he paid for a subscription.” But strong evidence that Oswald received The Militant in the months before the assassination comes from a November 26, 1963, invoice of materials belonging to Oswald that were recovered from Ruth Paine’s house in Irving, Texas, by the Dallas Police Department the day after the assassination. Among many other items, one item that was recovered included one copy of the October 7, 1963, issue of The Militant. The presence of an October issue of The Militant amongst Oswald’s possessions gives strong indication that he indeed had been receiving The Militant in the fall of 1963. Although 1964 FBI interviews of Marina Oswald, Michael Paine, and Ruth Paine found that none of these individuals was aware that Oswald received or read the October 14, 1963, issue of The Militant, there are plenty of other indications that Oswald was subscribed to and had received the newspaper during the fall of 1963 and even that copies were delivered after the assassination. For instance, he sent a “Change of Address Notice” date stamped “November 14, 1963,” to The Militant indicating that the periodical should be sent to P.O. Box 6225 in Dallas. Again, this can illustrate that he indeed desired to receive his subscription to The Militant. In addition, although providing no precise date, U.S. Post Office Inspector Harry Holmes stated that Postal Inspector Joseph Zarza received an order that mail addressed to P.O. Box 30061 in New Orleans be forwarded to 2515 W. 5th Street in Irving - Ruth Paine’s home. In fact, Ruth Paine indicated that her Irving home had been delivered one issue of The Militant addressed to Oswald “about a week following the assassination.” Also, in early December 1963, Marina Oswald described that she received two issues of The Militant addressed to Oswald, forwarded from his New Orleans post office box, but did not recall the exact date of these issues as she threw them away since Oswald had died. Evidence indicates that Oswald was also subscribed to and received issues of The Worker during a period from August 1962 until February 1964 (obviously, after the assassination and Oswald’s death). According to the Warren Commission’s analysis of Oswald's finances leading up to the assassination, Oswald paid $2.00 for a subscription to The Worker in August 1962. In fact, a subscription blank and receipt of Oswald’s purchase provided by the General Manager of The Worker -- Joseph Brandt -- to the Commission shows that Oswald, on August 6, 1962, paid $2.00 for a three-month combination subscription to The Worker and the Midweek Worker to be sent to a Fort Worth, TX, address. Furthermore, the Warren Commission's analysis shows that Oswald paid $7.00 for a subscription to The Worker in February 1963. Note that the higher price indicates that Oswald paid for a one-year subscription to the periodical. In fact, a blank order form for a subscription to The Worker and the Midweek Worker shows that it cost $7.00 for a one-year combination subscription for the two newspapers. So, Oswald's subscription to The Worker would have ended around February 1964. In fact, an FBI report examining an issue of The Worker addressed to Oswald revealed that it displayed a label reading “2-20-64-MR-W CR,” indicating that Oswald had a twelve-month subscription to the newspaper expiring on February 20, 1964. Similar to The Militant, a clear indication that Oswald actually received The Worker in the spring of 1963 is evident in the “backyard photographs,” which, again, was taken in March 1963. Oswald is holding a copy of The Worker. According to an FBI examination, Oswald is specifically holding the March 24, 1963, issue of The Worker. It should also be noted that Oswald had displayed a desire to continue to receive the newspaper in the summer of 1963, as on July 8, 1963, he sent a change of address notice to the periodical, switching his address from 4907 Magazine Street in New Orleans to P.O. Box 30061 in New Orleans. Moreover, there are several indications that Oswald had been delivered The Worker in the fall of 1963 --the period in which the assassination took place. For example, the Warren Commission indicated that, as Oswald rented a room from Mrs. A. C. Johnson at 1026 North Beckley Avenue in Dallas in October 1963, he spent evenings alone in his room reading his subscriptions of various periodicals, such as The Worker. While this does not provide hard evidence, just as with The Militant mentioned earlier, strong evidence of Oswald’s reception of The Worker is made evident by the November 26, 1963, invoice of materials belonging to Oswald that were recovered from Ruth Paine’s house by the Dallas Police Department the day after the assassination. Along with a copy of an October issue of The Militant, another item that was recovered amongst Oswald’s possessions included one copy of the October 20, 1963, issue of The Worker. Additionally, in a photograph taken in the days immediately following the assassination of items recovered from Ruth Paine's home, a copy of the October 27, 1963, issue of The Worker is present amongst Oswald's possessions. Furthermore, in a July 1964 FBI interview, Ruth Paine indicated that, during a period between November 12, 1963, and November 29, 1963, one issue of The Worker addressed to Oswald was sent to her Irving home, but she destroyed the item sometime within a week after the assassination. In addition, Marina Oswald also stated that one issue of The Worker was, in early December 1963, forwarded from Oswald’s New Orleans post office box to Dallas, but she disposed of it since he had died. Thus cards sent from Oswald to each newspaper, FBI reports and photographs, and witness testimony of Mariana Oswald and Ruth Paine, show that Oswald was subscribed to and had been delivered both The Militant and The Worker not only during the early months of 1963, but also during the summer and fall of 1963. The latter is important, as issues from this period were published in a time more immediate to the assassination date, giving them a greater chance to leave a more recent impression on Oswald’s mind, as President Kennedy would ride through Dallas only a few weeks after their publication. Thus cards sent from Oswald to each newspaper, FBI reports and photographs, and witness testimony of Mariana Oswald and Ruth Paine, show that Oswald was subscribed to and had been delivered both The Militant and The Worker not only during the early months of 1963, but also during the summer and fall of 1963. However, it is simply not enough to determine that Oswald was subscribed to these newspapers. But now the issue is “what did these two communist papers say about Castro, his revolution, his regime, and U.S. policy toward the island nation.” Could reading these newspapers have convinced Oswald that Kennedy (and U.S. policy generally) was a threat to a regime which Oswald admired. The issues of both The Militant and The Worker, published during 1963, including in the fall, were extremely critical of President Kennedy and the U.S. government in regards to their policies against Castro and Cuba. For example, in the spring, The Militant “Kennedy Woos Tyrants to Help Strangle Cuba,” illustrating that President Kennedy wanted to organize a “collective Action” to impose control on Latin America to draw “an iron curtain around Cuba to prevent the spread of its revolutionary ideas.” Another article carried the headline “Castro Analyzes Shift in U.S. Line on Cuba,” which advanced that President Kennedy is persisting in his strategy to destroy the Cuban Revolution. The Militant also published an article on March 11, 1963, which is the issue held by Oswald in the “backyard photo,” called “Poll Shows 64% Against A U.S. Attack on Cuba,” which stated, “Washington’s campaign to crush the Cuban Revolution ... is in violation of international law, US law, and the rules of simple human decency,” and that U.S. the has presented an “unprecedented barrage of anti-Cuba propaganda” to the American public. The issues of both The Militant and The Worker, published during 1963, including in the fall, were extremely critical of President Kennedy and the U.S. government in regards to their policies against Castro and Cuba. In another example, The Worker urged that the “criminal blockade” established by President Kennedy needed to be lifted in “the name of humanity” to allow American aid to reach Cuba. In sum, examination of the contents of The Militant and The Worker reveals that each, in more than one issue and in many more articles than are discussed above, condemned President Kennedy and U.S. government policies towards the Castro regime and Cuba, and in many instances depicted each as a threat. Such a denunciatory tone could have certainly appealed to a pro-Castro and pro-Cuba individual such as Oswald, as the newspapers embraced issues important to the causes of the Cuban Revolution. So, a subscriber in 1963, such as Oswald, would certainly have had the opportunity to be exposed to enough material from each newspaper to adopt hostile views towards President Kennedy and the U.S. government.
. . . the claim that the U.S. will not stop in applying efforts to bring down the Castro regime and the Cuban Revolution certainly allows a reader to conclude that the U.S. government was a considerable threat and enemy to the Revolution . . . Thus, it is quite clear that strong anti-U.S. rhetoric was published in The Militant and The Worker in the beginning of October 1963, which was just over one month before the assassination. In particular, the claim that the U.S. will not stop in applying efforts to bring down the Castro regime and the Cuban Revolution certainly allows a reader to conclude that the U.S. government was a considerable threat and enemy to the Revolution, especially as Castro is essentially accusing the U.S. of holding double standards as it plots against Cuba. With language and images like “noose,” “war,” “strangle,” and “attack and kill,” which all aim to heighten the severity of the situation, these articles would certainly tap into the emotions and mind of someone like Oswald concerned about the welfare of the Cuban Revolution, as Castro depicted the U.S. as an enemy that will ruthlessly work to bring an end to the Revolution. Moreover, Castro also stressed that, “The enemy is there, 90 miles away, harassing us, blockading us, threatening us, trying to destroy us.” As he depicts the U.S. as a direct enemy to Cuba, he formulates a vision for Cuba's foreign policy, in that “Imperialists are our enemies and we shall know how to be their enemies ...our line is consistent with anti- imperialism; fundamentally, the line of anti-U.S. imperialism.” Simply put, Cuba’s foreign policies ought to be those aimed at combatting their enemy - the U.S. government. While President Kennedy was not specifically targeted in Castro’s speech, as a subscriber to earlier issues of each newspaper, Oswald would have been exposed to enough articles that do directly criticize President Kennedy when it came to U.S. anti-Cuba policy. In other words, plausible speculation can be made that a subscriber in 1963 could have connected the dots to consider that Castro’s discussions of U.S. anti-Cuba policies point to President Kennedy as the ringleader of such efforts. In addition, Castro’s call for each supporter to consider their personal duty could perhaps entice one to answer the call and aid the Revolution in any manner that they can. Castro’s call for each supporter to consider their personal duty could perhaps entice one to answer the call and aid the Revolution in any manner that they can. Alongside displaying that Oswald was subscribed to The Militant and The Worker in 1963 and that each embraced pro-Cuba and pro-Castro stances, especially in a time close to the assassination, another point worth discussing is if any evidence shows that the newspapers ever left an impression on Oswald in any way, whether or not pertaining to the assassination. One indication that these newspapers made an impression on Oswald comes from The Warren Commission Report. It asserted, “In speaking of the Worker, Oswald told Michael Paine, apparently in all seriousness, that ‘you could tell what they wanted to do...by reading between the lines, reading the thing and doing a little reading between the lines.’” Oswald’s quote here indicates that he closely engaged and contemplated the material of these newspapers, at least that of The Worker. In this way, there is reason to believe that, had he read it, the hostile views of President Kennedy and the U.S. as presented by The Militant and The Worker would have caught Oswald’s attention and made some sort of an impression on his mind. Could Oswald, had he read this, had decided to answer Castro’s charge to oppose U.S. imperialism using the “rifle” to murder the President of the United States so as to serve as a guardian of the Revolution to halt U.S. anti-Cuba policies? We cannot know. But we can know that the tenor of these statements could easily convince a Castro supporter that the U.S. government, and specifically John Kennedy, were threats to the Cuban Revolution. Further, Castro’s call for each supporter to take on U.S. imperialists could have inspired one to answer this charge and aid the Revolution by, perhaps, killing the enemy’s leader. Fred Halstead, “Kennedy Woos Tyrants to Help Strangle Cuba,” The Militant, The Militant Publishing Association: March 18, 1963; William Bundy, “Castro Analyzes Shift in US Line on Cuba,” The Militant, April 29, 1963. Fred Halstead, “Poll Shows 64% Against A U.S. Attack on Cuba,” The Militant, Vol. 27, No. 10, March 11, 1963. “A Poet's Letter to President Kennedy,” The Worker, Publishers New Press, Inc., July 3, 1963. Beatrice Johnson, “Peruvian Priest Visits Cuba, Hails Progress There,” The Worker, October 20, 1963. “Castro’s Great Speech,” The Worker, July 7, 1963. “Kennedy’s Attack on Students Who Defied Cuba Travel Ban,” The Militant, September 16, 1963; “Ban U.S. Travel by 2 Indicted for Cuba Trip,” The Militant, November 4, 1963. “Lift the Blockade! Help Storm-Devastated Cuba,” The Worker, Vol. XXVIII, No. 185, October 13, 1963; “CP Urges Support To Cuban Relief,” The Worker, Vol. XXVIII, No. 187, October 27, 1963. “An Important Speech by Castro: Affirms Cuba’s Independent Foreign Policy,” The Militant, Vol. 27, No. 35, October 7, 1963. “Cuba’s Peace Policy Described by Castro,” The Worker, October 1, 1963. “A Major Policy Speech by Fidel Castro: ‘What is Our Line? The Line of Consistent Anti­ Imperialism’ ...Fidel Castro on Cuba's Foreign Policy,” The Militant, Vol. 27, No. 36, October 14, 1963.